See what I mean? 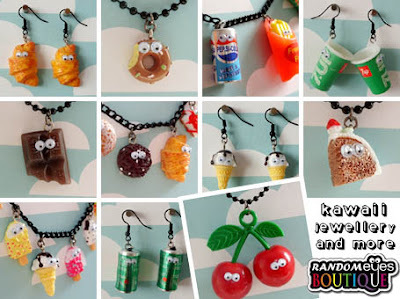 At Randomeyes Boutique you can by incredibly cute jewellery and accessories all adorned with wonderfully fun googly eyes! And talk about a wide selection - it’s got rings, it’s got bracelets, it’s got earrings, it’s got pins, it’s got mirrors, it’s got keyrings… in fact, it’s got just about everything you could ever wish for! And if that isn’t fun, I don’t know what is! I know, it is incredible, isn’t it? 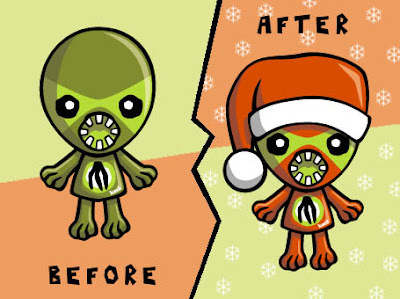 Who would have thought that anyone could possibly have turned your freakishly monstrous self into a cuddly Christmas cutie? And all it took was a bit of red body paint and a cheap Santa hat! Plus a little bit of snow for that truly festive feel! Absolutely remarkable! But then again, what else would you expect from yours truly :) Enjoy! 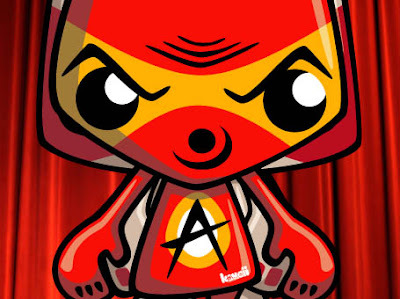 When I first joined the KawaiiPunk mascots I did worry about how much I could contribute to this blog. After all, being a wrestler doesn’t exactly lend itself to the fluffy world of kawaii! But thankfully, both for you and myself, these concerns proved to be premature. For not only have I managed to find a cute shop, I’ve also found some cute wrestlers too! Welcome to the wonderful world of Ink Rain. Pretty cool, isn’t it? At the Ink Rain RedBubble shop you can find the wonderful designs shown above on t-shirts, kids clothes, and stickers - and those are just some of the designs available! There’s also cats, horses, zebras, and even a duck billed platypus waiting there for you! 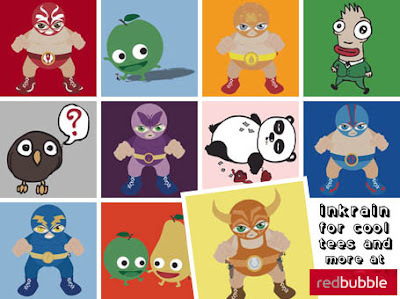 And, of course, there’s also my personal favourite… lots and lots of wrestlers! Fantastic! See what I mean? It appears the Serious Mascot has managed to take a double exposure while posing for a new portrait, although quite how he managed this with a digital camera is another puzzle in itself! 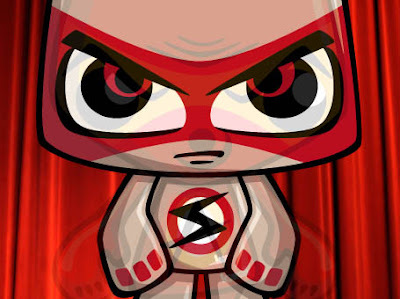 But let’s not dwell on that, because the question I want answered is… who is the mysterious ghostly figure standing behind the Serious Mascot in the photograph? Find out if you worked out who it was when the answer is revealed in this month’s monthly round-up! 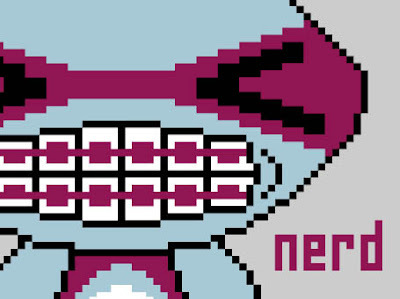 It’s an absolutely amazing pixel art picture of your own good self! And what’s more, if you’ll excuse me blowing my own trumpet for a little bit longer, I reckon it captures your unique nerdiness in an amazing display of low res glory! In fact, it’s just a shame I don’t have the know-how create an entire game for this amazing creation, as I reckon any such game would be an absolute corker! Fantastic! Thanks Harold! 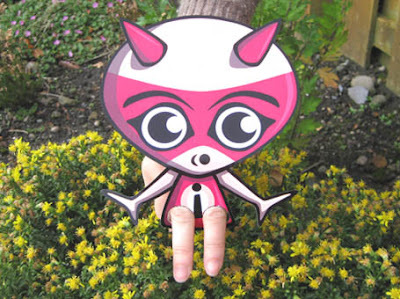 That is undoubtedly the coolest thing anyone has ever sent me since I joined the KawaiiPunk mascots! Although given the last thing I was sent (Re. Nerd No More!) I don’t think you’ve got too much competition to worry about! It is often said that our school days are the happiest days of our lives, and I reckon I know the reason why - super cool stationery! Well, you didn’t think it was going to be all that boring Roman history and Shakespeare, did you? Of course not! And today, thanks to a little shop called Cool Pencil Case, I’m going to help you relive those carefree days of scented erasers, pencil toppers and, of course, pencil cases! 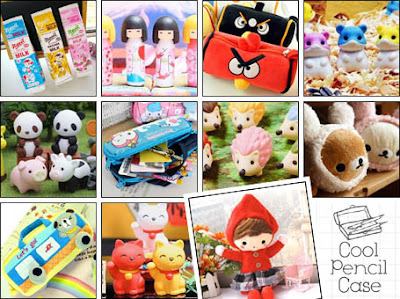 What you are looking at above are just some of the amazingly cool products available from Cool Pencil Case. The shop itself sells pencil cases, pencil erasers, pens and pencils, desktop supplies, letter sets, journals and more! All of which are among the coolest examples of stationery goods you’re ever likely to see! And all of which are seriously darn cute too! Result! 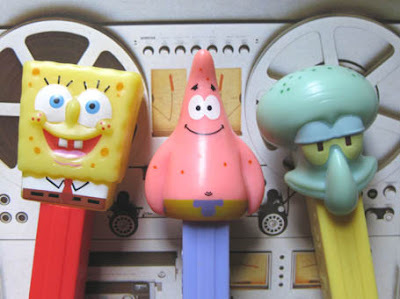 Yes, that’s right, it’s that super cute classic… the PEZ candy dispenser! For over half a century now the PEZ candy dispenser has been delivering sweets to boys and girls (and mascots too!) the world over! And it doesn’t look like it’s about to stop doing so any time soon - the mark of a truly great gadget if ever there was one! And, unlike many a modern gadget, you don’t have to take out a second mortgage to buy one! Perfection! Ta da! It’s the incredible Squid & Pig’s Shop! 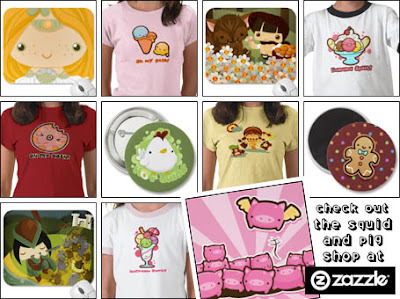 The Squid & Pig’s Shop is a Zazzle store that sells t-shirts, clothing, bags, mugs, badges, keyrings, stickers, mousepads and much, much more! And believe me when I say, the adorable artwork adorning these aforementioned goodies is undoubtedly amongst the cutest I’ve ever seen! And, given that I am the Cute Mascot, you can be sure I know what I’m talking about! I noticed that last month one of your readers sent your colleague the Clown Mascot an email about cosmetics. (Re. Clown Cosmetics!) An absolutely terrifying prospect, as I’m sure you’ll agree! But one that got me thinking… although the Clown Mascot may not have been the ideal starting point for a beauty revolution, that doesn’t mean that all of you other mascots have to be non starters too! Can you guess where I’m going with this? 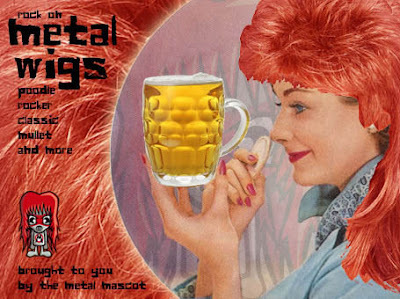 Yip, that’s right, it’s Metal Mascot wigs! You see, unlike your previous reader I happen to think the 1980s were an absolutely amazing decade - particularly for hairstyles! After all, who doesn’t look good in a poodle perm or a mullet? Am I right? Of course I am! And so I have created an example of what these Metal Wigs may look like! And, if you ask me, I reckon they look pretty rad! Wow! Thanks Keith! It’s always nice to hear from an enthusiastic reader! Although I do fear your idea may be harder to get off the ground than you think! After all, do you really think the world is ready for a Pat Sharpe revival? Delicious, isn’t it? 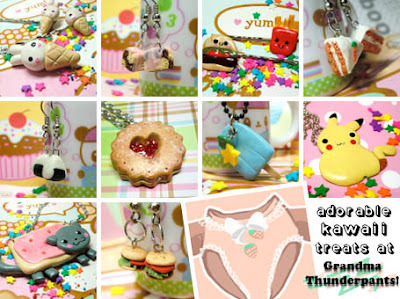 Grandma Thunderpants is a super cute shop that sells beautifully hand crafted jewellery and accessories, and every one of them is an absolute to joy to behold! Not to mention absolutely adorable too! And with everything from necklaces and earrings to bracelets and phone charms you can be sure this is one shop you’ll be going back to again and again! And again… and again! Bon appetite, readers! As you can see it’s basically a picture of yourself with finger holes cut out where your legs should be. Which means fingers can be inserted where the aforementioned legs should have been, and with a little bit of nimble dexterity the illusion of walking can be created! Or running! Or skipping, hopping, or even falling over! I reckon it’s pretty cool for five minutes work! What do you think? Jemima, I absolutely love it! Although I have to disagree with your assertion that it’s not an artwork! After all, around these parts I am often referred to as a piece of work! Tee hee! Ta da! It’s the teddy-tastic Bijou Kitty! 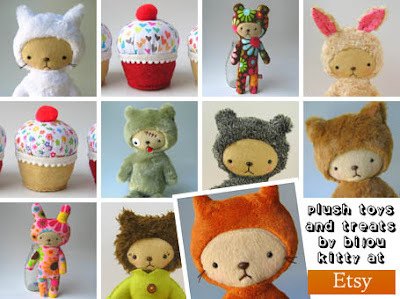 At the Bijou Kitty Etsy shop you can buy adorable hand crafted teddy bears for all your gift giving needs! And you can do it all from the warmth and comfort of your own home! No more trudging through the snow and rain. No more queues. No more headaches. Just sit back, click your mouse, and rest easy in the knowledge that a beautiful brand new teddy bear will be winging its way to you very soon. Absolutely perfect! A previously pleasant experience could become a nightmare this month. Beware of Christmas shoppers if you value a quiet life! You have been warned! A little white lie could come back to haunt you this month, but the truth could be even worse! Best just keep your mouth shut for the next 4 weeks! Knowing exactly what you want could be the key to your success this month. Unfortunately, however, not knowing how to get it will undoubtedly be your downfall! Now’s a good time to grow a moustache if you’ve been thinking of growing a moustache. If you haven’t been thinking of growing a moustache, then don’t bother! Avoiding reading sentences that begin with the letter “A” and end with the letter “H” will be your key to happiness this month. Learning from you mistakes will serve you well this month. Although not making those mistakes in the first place would be even better! Think on! Taking a loved one away for a romantic weekend is indeed a thoughtful gesture. Just make sure the loved one in question is your loved one! An encounter with a hippo wearing dungarees could lead to an embarrassing incident! Avoid hippos wearing dungarees and you should be OK! What at first seems like a good idea could prove to be a bad idea this month. So the best idea is to avoid ideas altogether. Get the idea? A misheard conversation could lead to an awkward misunderstanding! Avoid this by paying more attention when eavesdropping. Or alternatively, just stop eavesdropping! In fashion there’s a fine line between right and wrong. Tread carefully this month to avoid the latter! Or prepare for embarrassment and ridicule!